My research covers a broad range of topics, including mixed effects models in forestry and natural resources, design and analysis of experimental data, quantifying size and structure distributional differences in natural systems, and quantifying model uncertainty. My research aims to promote better conservation and management of natural resources by developing a better understanding of the dynamics of natural systems. My research is in three main areas: 1) advancing models of carbon fluxes derived from eddy covariance (EC) studies, 2) developing models characterizing the population dynamics of Bertholletia excelsa (Brazil nut); and 3) enhancing models of urban forest structure and growth, and their responses to exotic invasive woody species. 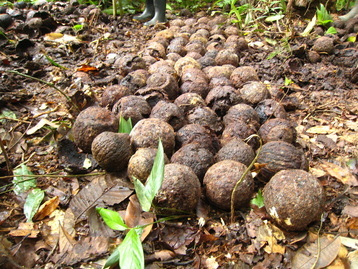 The Brazil nut is an economically important non-timber forest species that is collected exclusively in old-growth mixed-species forests largely by rural forest dwelling peoples in Brazil, Bolivia, and Peru. The management of these species and others in the Amazon basin is paramount in sustaining rural peoples and reducing rural poverty in the region. Data on this species present challenges, as they tend to be collected on multiple scales. Moreover, matching phenological cycles and external climate data is difficult, as the Brazil nut fruiting cycle takes 15 months to complete. To reduce the complexity of data, I use time series methods to identify cycles and cross-correlations, and mixed modeling techniques to ensure that temporal and spatial correlation structures are specifically accounted for using both small-and large-scale models of correlation. Models of small-scale correlation can be useful in quantifying inter- versus intra-genotypic competition, whereas models of large-scale correlation may help quantify environmental variability, such as the effect of soil type on competitive interactions among trees. Together with my colleagues, I have developed models of growth, production, and regeneration for this species that are a key part of its management, supporting human well-being in the region. I have been active in developing models to describe urban forest structure and function throughout the southeast US and Puerto Rico. These models are essential to quantify the important ecosystem services provided by community trees, such as pollution removal and C sequestration. Urban landscapes are also key ecosystems, in that most alien invasive woody species originate there. However, we know very little about the factors influencing their distribution in urban ecostems, and what variables affect the spread of these species into adjacent peri-urban areas. Through a grant from the USDA, I am investigating the distribution of alien invasive woody plant species within two tropical metropolitan areas: San Juan, Puerto Rico and Miami, Florida. We have found that the distribution of invasive woody species is greatly affected by socio-economic and biophysical variables, and human population demographics. Moreover, the landuse history of these two areas has lead to two distinct invasion patterns. This research has added new information about the primary mechanisms by which invasive species spread. Data from EC studies are generally processed at a half-hourly time intervals, along with environmental and micrometeorological variables. EC towers are often set up to measure changes in fluxes associated with environmental conditions such as changes in fire regime or climate change. However, few studies have statistically tested the drivers of carbon flux in a rigorous sense. Because of complex and long-ranging autocorrelative structures in the data, most researchers summarize data (e.g., monthly) to meet assumptions of independence necessary for analysis. However, non-normality in these distributions may bias summarized data. Instead, my research promotes time series methods to identify the drivers of CO2 fluxes. Incorporating these methods into flux research will aid in better quantification of sequestration/ emission of greenhouses gases between terrestrial biomes and the atmosphere. The major goals of this proposed work are to 1) quantify the impact of forest management and disturbance on biodiversity, biogeochemical cycling and climate regulation at plot to continental (i.e. macrosystem) scales, 2) develop a framework for assessing the role of spatial and temporal scaling of stand-level hypotheses to regional domains, and 3) assess the potential to incorporate realistic, computationally tractable models of forest management into Earth system modeling. We define four types of forest management for this study: production forestry, ecological forestry, wilderness/preservation, and neglect. During the first phase of our project, we focused on two regions: the southeastern US and the Pacific Northwest. In our current grant, we have expanded our study area to the continental US. 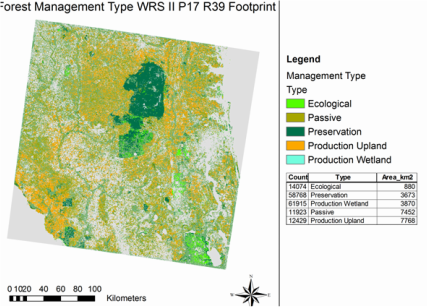 In order to accomplish our research goals we will complete five tasks: Determine scales of analysis, map forest management types, review stand-level effects of management on ecosystem processes, build management into the ED2 ecosystem model, assess model predictions against field data sets at multiple scales. Funding for this project is provided by National Science Foundation grant No EF-1241881 and EF-1702996. For more information, see our project website.